Polymath critic Teachout (The Skeptic, 2002, etc.) cogently introduces general readers and dance neophytes to the choreographer who reinvented ballet for the 20th century. Yes, it’s a biography: the author takes us from the birth of Georgi Balanchivadze in St. Petersburg in 1904 through George Balanchine’s death in 1983, when he was revered as the presiding genius of the New York City Ballet, nurturer of countless brilliant ballerinas (many of whom he loved and married), and creator of a brilliant variety of dances that brought ballet into the forefront of modern culture. 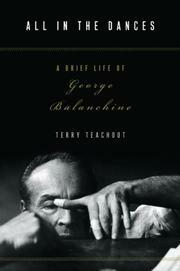 Teachout notes that the trauma of separating from his family during the Russian Revolution may well have led to Balanchine’s inability to form lasting relationships, both personally and professionally, as seen by his using and discarding Tamara Geva, Vera Zorina, Maria Tallchief, Tannaquil Le Clercq, and Suzanne Farrell, among others. But what really interests the writer is the choreographer’s relationship with Igor Stravinsky, Sergei Prokofiev, and Wolfgang Mozart, his deep understanding of music, and his ability to make choreography that “instead of concocting redundant visual equivalents of the rhythmic surface of a symphony or concerto . . . plunged into its inner structure” in ballets that defined the art form for his age, including Apollo, Concerto Barocco, The Prodigal Son, The Four Temperaments, Stars and Stripes, and, of course, perennial crowd-pleaser The Nutcracker. Teachout covers everything from early work with the Ballets Russes in Paris through aimless years on Broadway—which Balanchine loved, as he did every aspect of American popular culture—to fulfillment upon the opening of NYCB in 1948. The writing is graceful, with a judicious use of primary sources, and Teachout movingly conveys his love for Balanchine’s art in a short text that makes no pretense to be the last word but fulfills its author’s intention that it serve as a layperson’s introduction. The perfect first book to read about Balanchine, and intelligent enough to have value for more knowledgeable admirers as well.